Israeli soldier abducted, earlier Wednesday, at least twelve Palestinians, and injured many others during massive invasions targeting homes and communities, in several parts of the occupied West Bank, including Jerusalem. In occupied Jerusalem, the soldiers invaded Shu’fat refugee camp, in the center of the city, searched homes and abducted Monther Najjar. The soldiers also invaded Rash Khamis area, near Shu’fat refugee camp, and abducted Mohammad Khaled Sheikha, in addition to a child, identified as Mohammad Obeido, from Ras Shehada area. Also in Jerusalem, the soldiers abducted two young men while leaving the Al-Aqsa Mosque, and took them to an interrogation facility. The two, who remained unidentified at the time of this report were abducted near Bab al-Asbat (The Gate of the Tribes). In addition, the soldiers invaded Beit Rima town, northwest of the central West Bank city of Ramallah, and surrounded the home of Farah Rimawi, before storming the property, and abducted his son, Adli, 27, who is a former political prisoner. The soldiers also shot a young man with a rubber-coated steel bullet, in the town, and fired many gas bombs at Palestinians, protesting the invasion. Several army jeeps also invaded the al-Biereh city, before dozens of soldiers surrounded and stormed many neighborhoods, especially Sateh Marhaba. 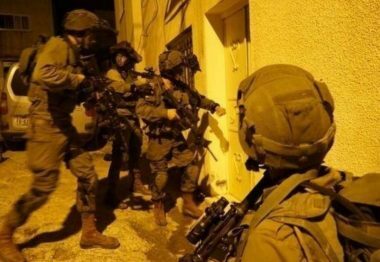 The soldiers also invaded Qalqilia city, in northern West Bank, searched many homes and abducted Ahmad Samir Abu Thiab, 19, and Ra’fat Doweiri, 22. In Tulkarem, in northern West Bank, the soldiers invaded Nur Shams refugee camp, and Bal’a town, east of the city, and abducted Hamza Fathi Qar’awi, and Tha’er Rida Mer’ey. In Jenin, in northern West Bank, the soldiers invaded Kafr Dan village, west of the city, searched homes and summoned Ahmad Adnan Mer’ey for interrogation. During the invasion, the soldiers also interrogated many Palestinians in their homes, and fired gas bombs and concussion grenades, before withdrawing. In Beit Ummar town, north of the southern West Bank city of Hebron, the soldiers abducted two Palestinians, and injured several others, during protests the took place following the invasion. The abducted Palestinians have been identified as Saed Emad Sleibi, 22, and Mohsin Mohammad Za’aqeeq, 17.